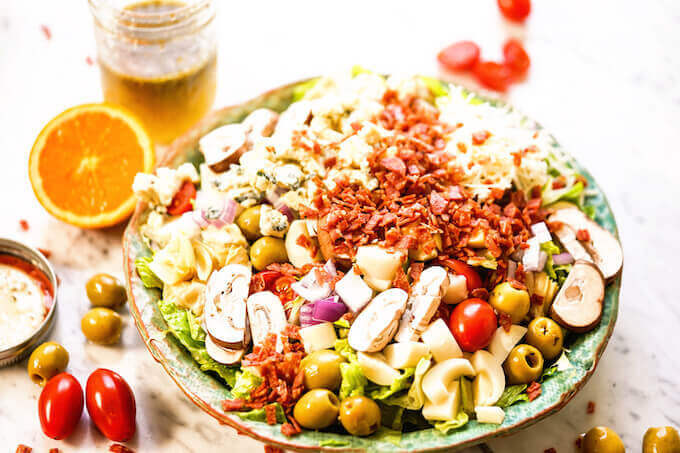 The big bold flavors in this Steakhouse Salad will compliment your meal perfectly! Blue cheese, artichokes and hearts of palm pair perfectly with sweet homemade vinaigrette. No boring salads here! Best Green Salad ever, this will be your new go-to salad for every meal! 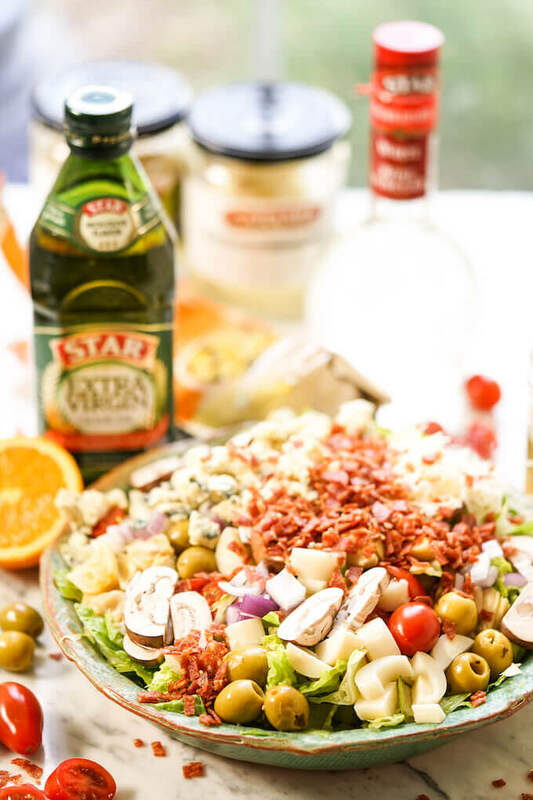 Ingredients you will need are romaine lettuce, salami, tomatoes, mushrooms, red onion, green olives, hearts of palm, marinated artichoke hearts, blue cheese, Romano cheese, orange, olive oil extra virgin, sugar, white wine vinegar, honey, Italian seasoning, garlic powder. Steakhouse Salad – Hands down the BEST salad ever! I was born and raised in St. Helens, Oregon. I’m a hometown gal and grew up in that small town. Because of that, I’ve learned to make and love the connection to family, friends and the neighborhood when you are present in your community. Now, I’m all grown up, married and living in Fresno – that sense of community has never left me! I volunteer and bake birthday cakes for foster kids, enjoy the local produce at our farmer’s markets and every time I fly out of Fresno, I would pass the display for Star Fine Foods and think… why haven’t I contacted them? They are located right here in Fresno! So today, I’m so excited to share another recipe and this is for HANDS DOWN the BEST salad you will ever eat! Sounds like I’m bragging right? But I’m not, because it starts with fried salami. Yup! You heard me right! Salami is minced into a fine dice and fried in olive oil. Minced Salami fried with heart-healthy Extra Virgin Olive Oil. The salami is fried until the fat is rendered from the meat and it is crispy. If you like bacon bits, this salty little bite kicks bacon bits to the curb! YUM!!! This salad is studded with Hearts of Palm, Artichokes and Green Olives bathed in Olive Oil, Garlic, Parsley and Herbs of Provence. Of course, there are plenty of fresh vegetables too: Romaine lettuce, tomatoes, onions and mushrooms. The Steakhouse Salad is all brought together with salty Romano cheese and creamy blue cheese crumbles. Topped with a sweet homemade vinaigrette, in a word this salad is AMAZING! Love the salty fried bits of salami in this tasty salad! 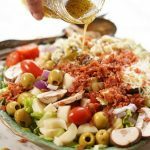 Be sure to make your own homemade vinaigrette to top this salad with! Fry the salami in olive oil until crispy. Drain set aside. Add all of the vinaigrette ingredients to a small jar with a screw top lid. 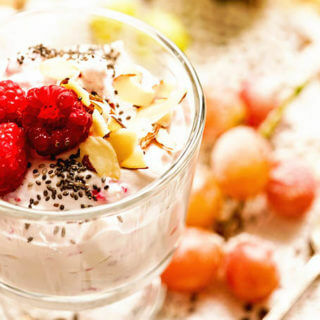 Shake vigorously to combine the ingredients. Prepare the salad ingredients and add everything to a large bowl. Lettuce, mushrooms, tomatoes and onions. Chop the artichokes, slice the hearts of palm and olives. Add to the salad. Add the Blue and Ramano cheese, top the salad with the fried salami. Shake the vinaigrette well and dress the salad. Enjoy! Tips to make a restaurant quality salad at home! A mixture of greens and herbs add interest and crunch. 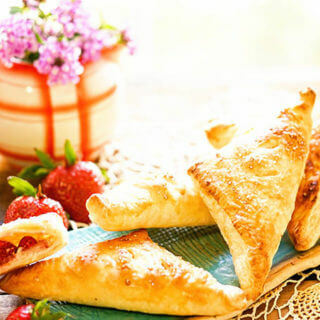 Salty cheese will add a burst of flavor as will a tangy, creamy cheese. Pickled vegetables accentuate the flavors. 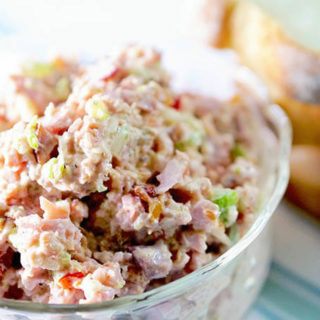 Salty meat – salami or bacon adds great flavor and crunch! Don’t overdress your salad with too much salad dressing! There’s nothing worse than a soggy salad right? Add a limited amount of salad dressing and mix to combine. It’s always easy to add more, but you can’t take it away! Add the salad dressing right before serving. Add the vinaigrette right before serving to keep your salad fresh! More delicious green salads to enjoy! Be sure to stop by my friends at Star Fine Foods and check out their amazing products. Shop for them online or at your local grocery store. 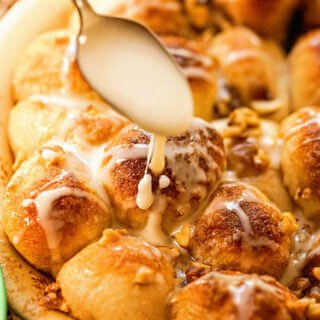 If you love this recipe, please comment below with a five-star rating! Also, I’d love it if you tag me on Instagram @bowl-me-over or #bowlmeover so I can see your yummy meal, enjoy! The big bold flavors in this steakhouse salad will compliment your steak perfectly! Blue cheese, marinated artichokes and hearts of palm pair perfectly with the sweet homemade vinaigrette. Start with the salami. Dice it into very small pieces. 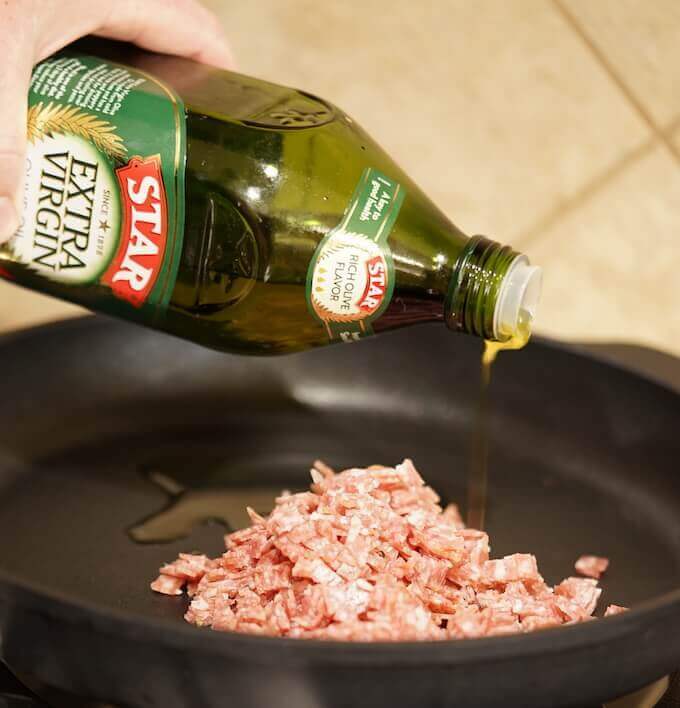 Add two tablespoons of Star Extra Virgin Olive Oil to a heavy skillet over medium heat. Add the minced salami. Fry until crispy 8-10 minutes. While the salami is frying, prepare the vinaigrette - add all of the ingredients to a small jar with a screw top lid. Shake vigorously. Set aside - give a good shake prior to dressing the salad. Remove the salami when crispy and allow it to drain on a paper towel. Set aside. Prepare the salad ingredients and add everything to a large bowl. Chop the lettuce, slice the mushrooms and tomatoes. Dice the onions. Chop the artichokes into bite-sized pieces. Slice the hearts of palm and green olives. Add to the salad. Add the crumbled blue cheese and freshly grated Ramano cheese. Top the salad with the fried salami. Shake the vinaigrette then lightly dress the salad. 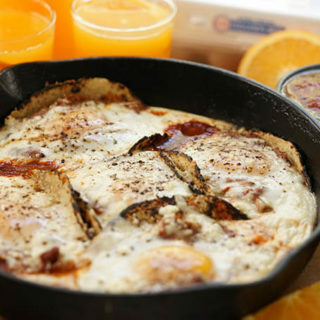 Enjoy as a meal or with your favorite grilled meat! We go through olive oil like we go through water. There is nothing better! And did you say FRIED salami? OMG a salad with all those Mediterranean flavors has me drooling! 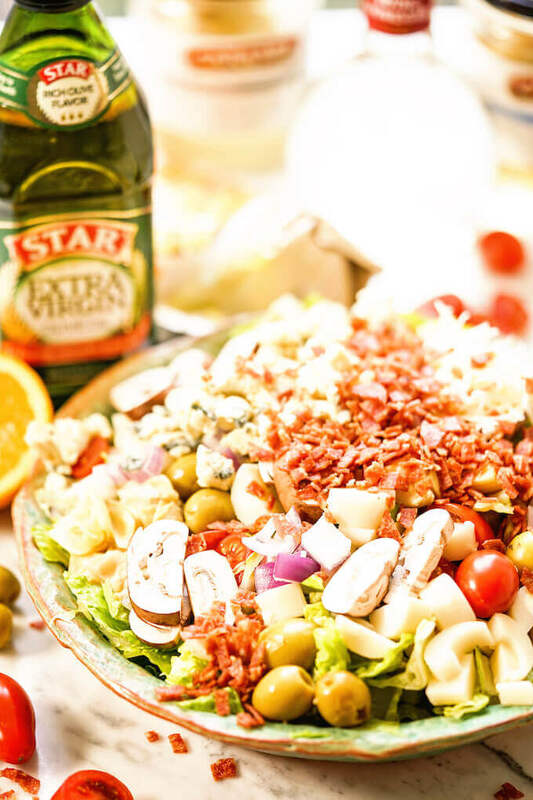 This is not an ordinary salad, this salad is an antipasto celebration! 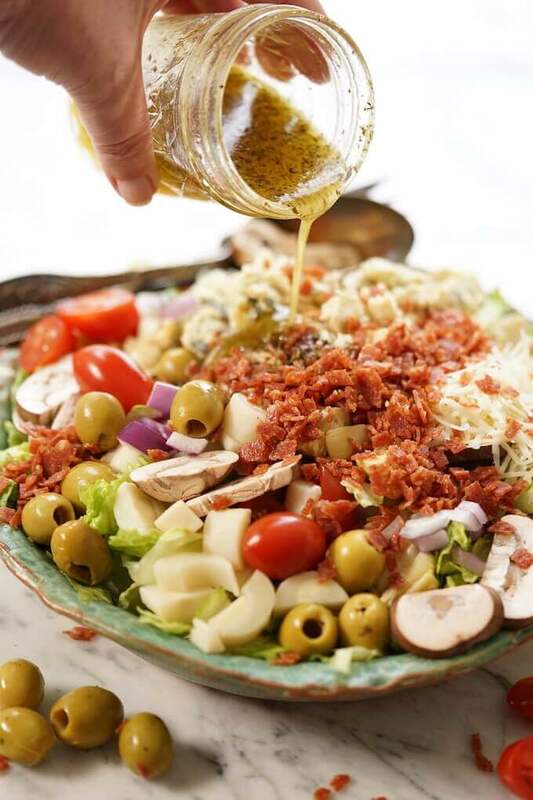 Your light vinaigrette perfectly compliments the amazing salad. Brava!! I know, right? It’s best for everything! 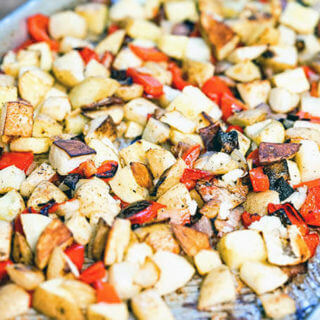 Sautéing, flavoring, that last finishing touch! You’ll love this salad, I hope you give it a try! That is one beautiful salad and I can’t wait to give it a try. It will definitely chase away the winter doldrums! Most definitely and perfect in the summertime too – enjoy Julie! I love salads that are actually a full meal like this! Fried salami would take it to that crispy, delicious place – can’t wait to try this! Most definitely, the crispy salami takes it right over the top – enjoy k!!! This salad looks amazing! So full of all those little goodies like I love. And that dressing looks so full of flavor! The dressing is dynamite and so easy Debi – thank you! Yay!! I’m so glad you enjoyed this meal and I’m loving your martini idea – cheers!!! This salad is the salad to end all stigmas about salads! We had this for dinner last night because I was supposed to take steaks out of the freezer and forgot so I made this salad instead and we didn’t miss the meat at all! Exactly, that’s what I’m talking about, it’s just the BEST salad thank you!!! This salad is AMAZING! I definitely need to try this. Most definitely Steph, you’ll love it – enjoy! This is my kind of salad!! Look at all of that stuff in there!! You are a woman after my own heart! Totally! I hope you give it a try Michaela, it’s so amazing!! !